If you wish to see a play in which text, movement, lighting and sound work in complete harmony to tell a story, then you should see “Aurash”. 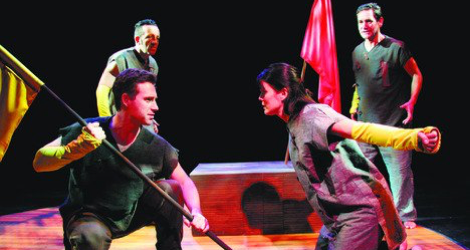 “Aurash”, translated and adapted from a narrative poem by the Iranian writer and film director Bahram Beyza’ie, was first staged in Toronto in April 1998 and has since become the signature piece of the Modern Times Stage Company that created it. It has already toured to Cuba, Iran and Bosnia, and after the current Toronto run will head off to Bosnia again and Colombia. Beyza’ie’s poem from the 1970s is based on an ancient Persian tale about one of Persia’s cultural heroes, Arash the Archer. The story recounts an long, bloody battle between Iran and Aniran (i.e., “not-Iran”) that is so destructive the two sides agree to make peace. They agree that an Iranian will shoot and arrow and wherever it lands will determine the border between the two nations. Arash, whose name means “swift arrow”, agrees, takes a bow and arrow made by an angel, climbs the highest peak of the Alborz mountains, and shoots the arrow with such force that he dies as a result and the arrow travels for days before landing. Beyza’ie presents a more complex version of the story, one that takes a much more ambivalent view of politics and redefines heroism not as physical but spiritual strength. Arash or Aurash (Michelle Latimer) is not already considered as the hero of the Iranians, but rather a man called Kashvad (Ron Kennell). Kashvad, refuses to shoot the arrow because no matter where the arrow lands no side will be satisfied and his name will be cursed forever. Arash, a simple stable-hand, is chosen by the Iranian Commander (Christopher Morris) to bring Kashvad’s message to the King of Aniran (Martin Julien). To his dismay, Aurash’s message is received with threats and ridicule and the King chooses Aurash himself as the bowman even though, or perhaps because, Aurash has never shot an arrow in his life. When Aurash returns he is beaten for his answer, yet the Iranians finally outfit him for the journey with Kashvad’s bow and arrow since Aurash is now their only hope. Beyza’ie turns Aurash’s journey up Mount Damavand, the Mount Olympus of Persian mythology, into a journey into the self. On the way he encounters voices attempting to dissuade him--his father’s voice, the voice of Kashvad, of Hoomann (Ron Kennell) an Iranian who defected to the other side, and even of the Alborz mountains themselves. As he experiences a kind of mystical death of the self, he also learns that he must shoot the arrow not with his hand but with his heart. He does so and dies, but the arrow, unlike that in the original story, never lands but continues to fly through all generations. This epic action all occurs in only an hour. Soheil Parsa and co-adapter Brian Quirt have turned the ensemble of four into both narrators and actors who often narrate the very events they enact. The narration is shared, as if a whole community is telling the story, but once an actor becomes identified with a particular part no one else plays that part. Parsa has directed the work primarily as physical theatre with all four actors adept at mime. The first section depicting the war is immensely powerful as we get glimpses of one scene of horror after the next as they emerge from Andrea Lundy’s highly controlled lighting for a moment only to sink back into darkness. Costume designer Setareh Delzendeh has devised a clever reversible fingerless glove that all wear--yellow on one side to represent the Iranians, red on the other to represent the enemy. Using this the actors can switch from one to the other in a moment. All the action is choreographed to Richard Feren’s extraordinary music and sound design which plays as much a role in telling the story as the words. It is invidious to single anyone out from a group who work so much as a team, but still the performance that draws us in most to the action is Latimer’s intensely emotional portrait of Aurash as a simple man, overwhelmed by his destiny but who, in climbing the sacred mountain, literally and spiritually rises to meet it. The only point of confusion comes at the very end when the chorus of Iranians assure themselves that Aurash will come again. This cry might suit the earlier form of the story, but given Beyza’ie’s retelling in which Aurash’s arrow flies unendingly through time and space, one wonders why someone like Aurash need return when the action he initiated still continues. One also wonders whether Parsa has universalized the story a bit too much. It may be a classic Persian story, but I longs for a greater sense of Persianness in its presentation. I also would have liked more information about Beyza’ie’s work in the programme. Despite these quibbles, in an age when millions are spent in the scenic design of musicals of little worth, this show is a welcome reminder of how so much can be created in the theatre with so little. In the theatre suggestion always wins out over lumbering physical representation. We have to thank Modern Times for helping broaden our knowledge of the world’s treasure chest of important stories. Photo: Christopher Morris, Ron Kennell, Michelle Latimer and Martin Julien. ©Naire Bahjat.